Cet article a été traduit en français. In these Web pages, I will discuss the functions, behavior and interrelationships of plant hormones. This is a further revision of the fourth and most recent version of my attempts. The first version was written in 1986 and was not published or posted on the Web until recently. The second and third versions were written in 1995 and 1999. When the 1995 and 1999 versions were posted on the Internet, they attracted much comment, both positive and negative. The earlier pages contain the basic ideas and may be easier to understand at first. In this paper plant hormones are divided into 3 groups: Growth Hormones, Stress Hormones and Shock/Synchronizer Hormones. In a nutshell, I generalize that Growth Hormones are an indication by the plant to itself that it is prospering and has excess nutrients. What the plant does with these nutrients and the signal is determined by other things. The hormones are made mostly in young and meristem cells and much less in mature cells. I hypothesize that Stress Hormones, in contrast, are made in cells that are faced with a scarcity of nutrients and again are an indication of such a condition. The Stress hormones are made mostly in mature cells and much less in immature (e.g. meristematic) cells. See figure 1 in full size. Finally, the Shock/Synchronizer Hormones as the name might indicate are rapid acting hormones for fast developing bad (or good) environmental condition including rapid changes in nutrient levels but in no way limited to it. The Shock/Synchronizer hormones "batten down the hatches" for the plant, or release it from this strategy. 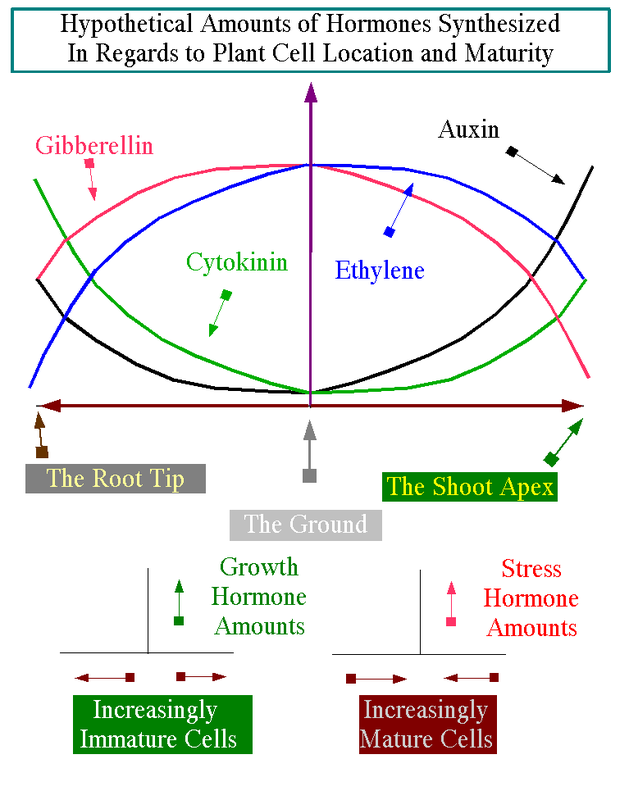 Auxin and Cytokinins (CKs) are Growth Hormones. Ethylene, Gibberellins (GAs) and Brassinosteroids are Stress Hormones. And Abscisic Acid (ABA) and Salicylic Acids (SAs) are Shock/Synchronizer Hormones. This paper sets out theory or assumptions or postulates. It's followed by predictions if the postulates are true and then comes an addendum. The addendum gives an alternate take on the Growth and Stress Hormones. It suggests these hormones may measure overall nutrient level, not their extent of excess or scarcity (by nick weigel) . That is are hormones like temperature indicators made in proportion to a scale and thus usually present in some quantity or are they not made at all until excess/scarcity arises? This paper will concentrate on the as needed excess/scarcity model but will briefly explain the "nutrient temperature" theory at the end in the addendum. The most glaring problem with the theory is Gibberellin is now thought to made mostly in young tissue not mature tissue. This theory also has a limited scope. I will only lightly touch on Brassinosteroid, Jasmonates and Oligosaccharins and not at all on Polyamines. It attempts to provide a backbone or generalized framework from which to understand plant hormone behavior, on which I hope others will elaborate. I want to put forth a structure of 3 pairs of complimentary hormones and suggest what the plant uses them for. This a "sketch" at best but I hope it will stimulate recognition of the simple general main functions of these hormones or hormone pathways-cascades. Again this is a view, perhaps even cartoonish, but nevertheless revealing in my estimation, of one facet of the "beautiful diamond" that is the physiology of plants.